If you’re throwing a kids birthday party, the chances of you serving alcohol are slim at best. However, other events like a corporate holiday party or large wedding may require a cash or open bar. 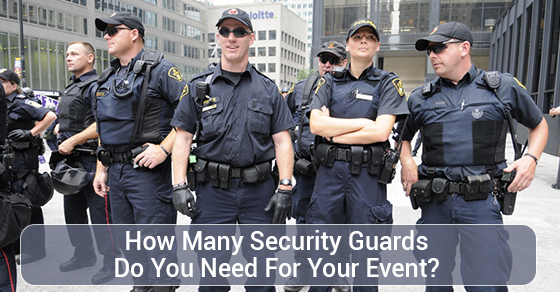 If your event will feature an open bar, with no food service you may need to increase the number of security guards. This is not to say that your guests will go wild and cause trouble but when alcohol is served in unlimited quantities without food, you risk the chance of one or two partygoers becoming unruly. When it comes to alcohol, think of it as one guard for every 75 guests. The size of the venue matters a great deal. If you’re hosting your 200-person event at a tiny club with only one exit, you’re making a very risky mistake and you’ll need security. On the other hand, if you’re holding that same 200-person event in a grand ballroom with multiple exits the need for numerous security guards is less. In an emergency situation, security guards are trained to remain composed and usher people to the exits in a calm fashion to avoid creating panic. In a small venue with one exit and too many people, this can prove challenging. The amount of people who will be at your event will be the final determining factor as to how many security guards you’ll need. 250-1000 people: 12 to 30 guards, and as aforementioned, the guards will need to be posted at exits, entrances and around the venue. Will you need a mobile patrol unit or armed guards? The chances of you needing armed guards at your event are slim. Unless you are hosting a political event, armed security personnel are not needed. A mobile patrol unit (guards on bikes, Segways etc.) is only necessary if your event is held outdoors on a large estate.